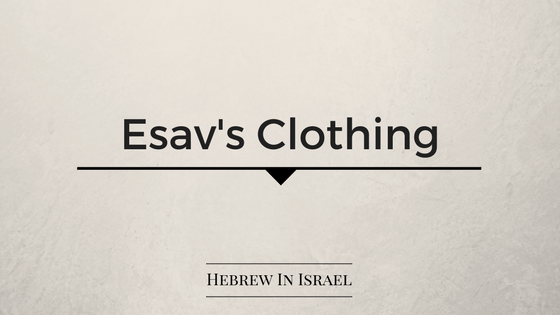 The Hebrew calls Esau’s clothing חמדת which is translated as best/favorite. The word חמדת comes from the root חמד which can mean “want, desire, expensive, beautiful” and so on. In our context, we need to understand that the clothing is unique to Esau, and therefore must be understood by defining who Esau was. It is important to note that clothing throughout all of time is a symbol of status and transition. When one becomes an official, one changes one’s clothing. And when someone dies, clothing is ripped to symbolize the ripping of the dead from life. Esau was a firstborn, and the text is dealing with the competition of blessings to be bestowed on the firstborn. This is the main conflict between the two brothers in our story. With this in mind, I am placing the argument that the clothing were a symbol of the firstborn. Jacob was to wear the clothing as part of his meeting with his father, and they functioned as a recognizing tool of the one wearing them. It is strange that the text points out the smell of the clothing, though they were kept in a tent. However, it could be argued that there is a hint here that though Jacob was physically the second born, spiritually he was the firstborn, and the smell which Isaac thought was a feature of Esau, was actually of Jacob. The smell is described as the smell which is a blessing of God, something which clearly is not the case with Esau. Because the verse is described from Isaac’s perspective, one might argue that the smell was not the clothing, but Jacob himself, telling us that there is more to Jacob than meets the eye. There is some irony in the fact that the word ראה (in general “to see”) is introduced before it says that the smell of Jacob is like the smell of a field. Another point is that when Jacob would have come close to his father, Isaac would have also touched him and felt the fabric. In the ancient Canaanite world, clothing was made with patterns and designs which could make such a fabric unique to the maker. The receiving of the blessing was a transition ceremony which usually is done with ceremonial clothing. When Esau was to receive the blessing, which would have made him the official bearer of them, he was expected to appear wearing this unique garment. When Isaac would have blessed Esau, he would have been able to feel the fabric and patterns and know it was Esau. However, the text stresses the smell, which was a spiritual element which Isaac expected to find in the son worthy of the blessing. Note that the text does not mention the clothing when Esau comes to receive the blessings. This is a hint that Esau was no longer the firstborn and had no right to wear them, reminding us of Esau’s disregard for the position of firstborn. Keeping these possible points in mind, the word חמדת can relate to several points: Expensive ceremonial clothing of the firstborn.